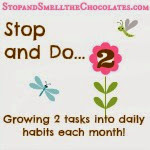 Stop and Smell the Chocolates: What A Fun Week! Hello! Good Monday morning to you! Nice to be back from my blogging break last week. And this will be such a fun week! First, I think I better give you an idea of what's going on this week, you know, so you can plan your schedule accordingly - LOL! Look at this super cute button that Sarah from Real Life made for me! 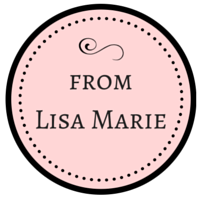 Perfect for dressing up your blog and spreading the word about the fun and giveaways! If you post it on your blog (or facebook if you don't have a blog), you'll get an early extra entry for the giveaways! Just leave a comment here telling me about it. Thanks for sharing the fun! *Friday - The party continues with Would You Like Chocolate With That? - a look back at the year of chocolate and your opportunity to link up chocolate posts. *Sunday - Happy Easter! Have a blessed Resurrection Day! *Monday - Last day of giveaways and it's actually my b-day! Well, I suppose you would like to know how last week was. It was really nice having a blogging break! Though I wasn't gone, I was busy with Spring Break sorts of things, baseball, and my Dad visiting. It was lovely having the mental break, but still hopping on occasionally to comment and twitter. Thank you so much to my sweet guest posters for helping me out: Kim, Sarah Mae, Alecia, Donna , and Pamela. You ladies are wonderful! I highly recommend using guest posters - I liked having them and I like being one, too. I think I'll write more on that in a future post. While Dad was here, we shopped and ate out a lot (hello - that's why I'm blaming Dad for my weight gain). We had a great time touring a Cavern and Dad and my son "mined" for gemstones - very fun! Dad also got to see one of my son's baseball games and it just happened to be the team's first win - Woo Hoo! Go Royals! Dad is back home now, but we hope that he will visit again soon! We ended our week with more baseball, a little relaxation, the beginning of a backyard project, and then a church potluck. Now hubby is off for this next week of Spring Break. I guess that means I will be busy - LOL! But it is my Blogaversary this week and my birthday in a week! Um, in case you didn't know - that makes this my birthday week. I may be using that fact to get extra fancy coffee drinks this week and to eat out occasionally! I was going to say that it should allow me not to cook, but then I remembered that it will be Resurrection Day this Sunday and I will need to cook for that! At this point, I think I'm making ham, scalloped potatoes, roasted vegetables, strawberry poppy-seed slaw and a couple different cakes ('cause I am still trying to get a Cake Week ready for you all in the next month or so). Guess I should end this! Long enough post for you? Well, you asked for it. oh. you didn't. oops. Can you say that again? I'm not sure I got it all the first time! LOL. Well you know I'm going to put your cute little button on my blog so add that extra entry girlfriend. I also think I should get another for having guests posted! LOL. And I know I can come up with a few more reasons why you should just give me everything and forget about the giveaway! LOL. Just kidding. Sort of. Hee! Hee! Big wow that was a really long post and I should have taken notes size hugs to you my friend. Glad you had a great week! Can't wait to hear more about your Blogaversary! Sounds like fun! 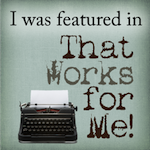 I posted about your blogoversary in my blog. Can't wait to join the party! Glad you have a good week with your Dad.